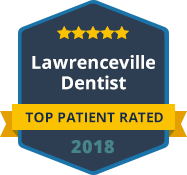 If you need sleep apnea treatment in Gwinnett County, Lawrenceville Family Dental Care is the name to trust for excellent care. We are a comprehensive dental practice that provides general, restorative, and cosmetic dentistry to patients of all ages. Dr. Ashish Patel is an experienced dentist who offers specialized treatment for sleep apnea. Sleep apnea is a serious condition in which people do not receive adequate oxygen while they sleep. Snoring is often associated with sleep apnea, and if your sleeping partner has brought it to your attention it is important that you be evaluated for sleep apnea. Dr. Patel takes all symptoms of sleep apnea very seriously because he understands that it is a very serious condition that can lead to very serious complications. Our dental practice features a highly skilled and trained dentist that delivers effective sleep apnea treatment. Sleep apnea is a sleep disorder in which the regular sleep patterns are interrupted due to people's breathing stopping and restarting repeatedly throughout the night. Sleep apnea can cause life threatening issues, and and any symptoms that you are aware of need to be evaluated by a professional sleep apnea expert. Not only can the lack of oxygen from sleep apnea cause severe symptoms, but a lack of rest to a body can endanger a person's ability to function and make clear decisions. At Lawrenceville Family Dental Care, Dr. Ashish Patel offers his medical expertise for treating sleep apnea symptoms and causes. Dr. Patel understands that early diagnosis and intervention of sleep apnea is critical in effective treatment. If you suffer from any symptoms of sleep apnea, please contact Lawrenceville Family Dental Care today to schedule a consultation.